The Chinese Swan Goose is the preferred goose for homeowners wanting a goose as an indoor pet. 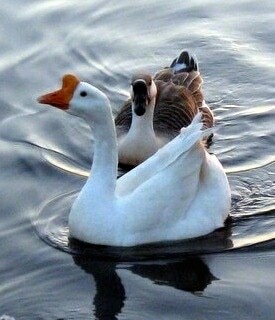 There are two varieties of the Chinese Swan Goose: brown and white. The white variety is by far the most popular. They have an orange beak with a pronounced bump at the base. This bump is more predominant in males than females. Their body is smooth and firm with a graceful neck. They also have strong legs. Their legs and feet are also orange. The best words to describe a pet goose that is well imprinted (as familiar with you as its parent): calm, docile, curious and gentle. It has been said that many imprinted young geese may actually seem to prefer human company to that of their own kind. 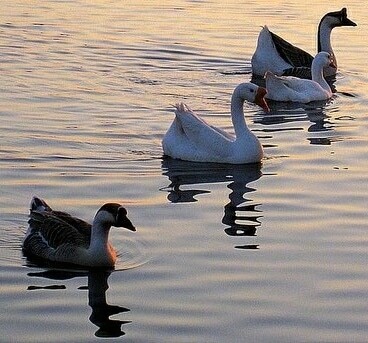 The Swan Goose (Anser cygnoides) tends to be the most chatty of the breed and are also considered to be great "watch dogs" because they will alarm you if anything should occur that they are not accustomed to or happy with. They can be testy with small children if they are not accustomed to them. It is important that if you raise a gosling for a pet you acclimate it to being around children. Teach your children to handle the animal very carefully and encourage hand feeding. This way they become close with the goose and vice versa. They range in weight from 2.5 to about 5 pounds. Baby goslings are not difficult to raise. For beginners, a small number should be attempted the first time around. You will need a small box (cardboard should do), a heat lamp, a feeder and a shallow bowl of clean water should do. In the bottom of the box place some straw or even a layer of paper towels for easy clean up. If you’ve never raised fowl before you will quickly become aware that they mess often. Watch your goslings to see if they’re comfortable. If they avoid being under the light that may mean they are too warm and you should either shut it off for a while or move it to a corner. As they grow they will need a larger box to be able to warm and cool themselves with ample room. Keep them enclosed for approximately 6 weeks until they can be outside (providing it is warm weather). If it is cooler weather, move them to an inside pen in your barn or shed where they can escape inclement weather and still have use of their heating lamp. You may need to provide more than one lamp if they are growing larger. These geese are prone to frostbite and burns on the bump on their beak in severe cold weather. Ducky diapers. What? You’ve never heard of duck diapers? Come on...you didn’t think you could potty train your house goose did you? If you want to keep your goose indoors there are several methods to diaper your goose to help keep your home clean and free of goose "messes." Some owners place a small plastic bag over the bottom (tail-feather area) of their goose. Your goose will become more accustomed to this procedure if trained as a gosling. Other owners have special harnesses that your goose can wear that have changeable inserts that can be replaced as needed. Some research on the Internet will give you several ideas on what you can do. You just might be surprised at how willing your goose is to wear a diaper! Geese are very easy to keep clean as they preen themselves. They also will bathe in water to remove dust and debris from their feathers. Provide clean water for them as this water over time will be dirtied and become a breeding ground for bacteria and a potential place to acquire an illness. Cereal type grain is preferred by wild geese. Your pet goose will be happy to consume weeds found in your lawn such as clover, dandelions, plantain leaf and grass and the variety is also good for them. Some owners add in vegetables (leafy) that can be purchased at the local market such as lettuce, spinach, etc. In fact, your goose will eat almost any plant. Goslings will need a feed that provides protein content. Geese need a starter feed for their early development stages (during the first three weeks or so). This food should have a protein content of approximately 20%. Some pet owners supplement their indoor goose’s food with a low-protein cat food. Also provide your pet with some type of grit to aid their digestion. It is very inexpensive and will help your pet digest his food and avoid digestion problems along the way. Also, don’t forget to provide your pet with the proper vitamins and minerals his growing body needs. (Consult your veterinarian or local feed store. )Your adolescent goose with go through a ravenous stage, much like a growing teenager. But don’t worry, this will slow as they begin to feather out and mature. Many pet geese love to follow their "parent" around the yard and some even like to go for walks. Many times you will find that your pet geese will not fly. They prefer to walk. Some will swim, some will prefer not to. But do provide clean water for them to bathe in to prevent parasites and illness. If you buy your pet goose a child-sized swimming pool, be sure to clean the water often as they will mess in the water. If you are the adventurous sort and decide to install a pond for them make sure the water can drain and cycle. In a cemented pond include a drain at the bottom for emptying and cleaning. In a dirt pond, a run off should be available so fresh water can fill into the pond keeping it fresh and recycled. In either case, a sandy area around the edge is a good idea to prevent them from destroying the grass around the pond’s edge and to keep the mud out of the water. Some geese can live to be 20 years or more. Longevity, of course, will depend on the care given to your pet. A responsible owner will take their life expectancy into consideration before purchasing. Geese can lay an average of 40-60 eggs per season. They lay 2 times a year, once in each spring and autumn. The average incubation period for a goose is approximately 28-34 days. The gosling will use the spike on its beak to open his egg. It is better for the hatchling if the egg is sprinkled or dipped in warm water for 30 seconds each day during the last half of the incubation period. This will make for an easier hatching process. The first thing the hatchling needs to see will be YOU! He will imprint you as his parent at this time. He needs to see you and interact with you often (several hours each day) to finalize this imprinting phase. And if you want your goose to be friendly and affectionate, he will need you to teach him just as any parent would do. The more time you spend with your gosling, the closer you two will become. China and Mongolia. Then brought to the U.S. and domesticated (some varieties). Most domesticated geese do not fly. Some geese can live to be 40 years old or more. Geese reach their mature size in just 12 weeks. Geese are raised by both parents. Some geese have been known to lay up to 100 eggs per year. Geese can be very affectionate. Many owners find that their goose enjoys going for walks or car rides with them. Geese have great memories and will remember things for quite a long period of time. Geese can be as loyal to their owners as a dog and they like to play with toys.